Excitement is brewing on the University of Nebraska - Kearney campus in anticipation of their Nebraskan Student Union renovation that will truly give "students something to smile about." 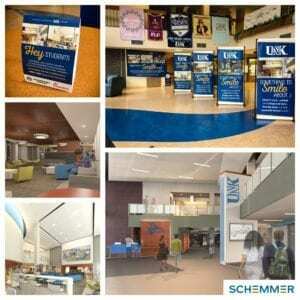 Banners and signs were posted in the student union that featured Schemmer's renderings of the updated space. Schemmer's new design for the student union revitalizes approximately two-thirds of the ground floor, with upgrades to interior finishes in the primary circulation spaces on the ground and second floors. The modern style design provides a more prominent Welcome Desk, better sightlines and wayfinding, and more open and connected student space. The student union will feature a video wall, new furniture, and Starbucks and Chick-fil-A were also incorporated as retail food service providers in the food court. Renovations are underway and are expected to be completed in September 2018. To take a closer look at the project, click here.